The ABC Book by Dr. Seuss is one of my favorite books to help kids learn their alphabet. But in the last few years, there has been a surge in alphabet books. Just name it, and chances are it's been done from sports to Christmas to animals and more. 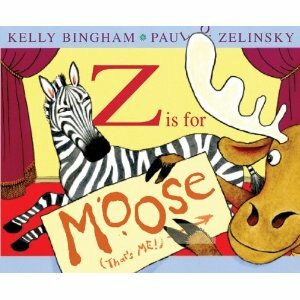 That's why when I received a copy of Z IS FOR MOOSE, I was hesitant, thinking, 'Oh great, another alphabet book.' However, as my kids and I read the story, I was pleasantly surprised. This is an alphabet book unlike any other. Sure, it starts with the usual. A is for Apple, B is for Ball, C is for Cat. However, things get interesting as soon as you turn the page to D and it reads, 'D is for Moose.' It seems as though Moose is a little confused and anxious as he begins to appear on various pages asking, "Is it my turn yet?" Zebra, who is directing his friends to appear on the correct pages really causes problems when he decides to go with mouse for the letter M. Well, let's just say Moose doesn't take it lightly. Will Zebra regain control and save the ABCs? Young readers will enjoy the humor of this book and how the illustrations interact with the text. Not only will they learn their alphabet, but they'll also get a good laugh.